Many would say that Anthony Joshua hasn’t been fully tested yet in the pro ranks with 18 of his opponents all being knocked out. “Yeah, when you look at it there isn’t anybody really he’s boxed whose world class. “He’s won the world title when the opportunity came at that time, and why not take it? – Which they done. “When you look at the other champions, you know, whether it be Joe Frazier or any of the others they were well down the list before they won the world title – So Joshua’s has come early. Joe Louis boxed in his 20th fight against Primo Carnera and that was in his 20th fight. Joe Frazier similar and all that type of thing. “This will probably be his biggest test but when you look at Fury, Tyson Fury that is, he beat Klitschko, but what Klitschko was left? I couldn’t believe Klitschko didn’t throw a right hand all night long unless he broke it or hurt it or did some sort of damage. He never put up an excuse or anything else. “It’s not as if Tyson Fury is any good. I don’t think he has a chance against Anthony Joshua. 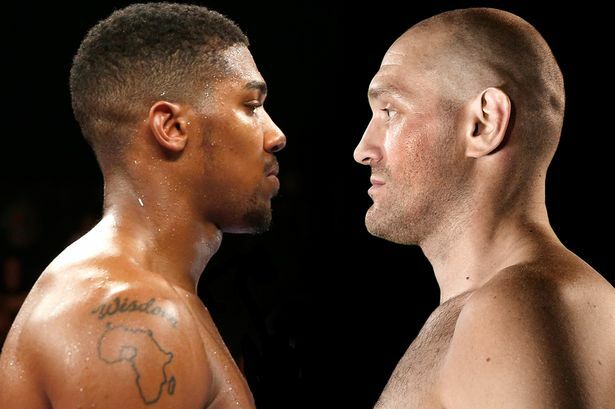 If he ever comes back and that fight comes off with Fury I know what exactly is going to happen – Joshua is going to knock him spark out. “I’ve seen them spar together far back as when Joshua was an amateur. Joshua put him in his place over four rounds; he went out with ice packs on. “I know exactly what the situation would be there. I think Joshua just won his second ABA title then and Sean said to me Tyson Fury came down the gym that would be 2010-2011, something like that. He came down the gym to spar with Joshua and Sean said “take the sparring”. “Joshua said to me “what shall I do?” I said listen “don’t let him take the piss out of you. He’s come down to take the piss out of you – give him everything, give him everything you got”. “Four rounds later, Tyson Fury could not go on any further and Joshua beat him up. Having said that Tyson Fury the next night, he went on to Steve Bunce‘s, show you could see all the lumps and bumps and what he had to him. “Steve said “what you been doing?” He said “I went down to Finchley to spar with Joshua” and “Steve said “how you get on?” Fury replied “To be honest I went down for an early night, easy night and I got beat up”. “He’s also put it in print with Melanie Lloyd who’s written three or four books. She’s put a section in there with Tyson Fury and he admitted to Melanie he got beat up by Anthony Joshua and he did and that’s when Joshua was amateur.